The body of Tsutomu Tosuka should once and for all put a sock in anyones mouth, who claims that with age we naturally decay and crumble. He proves what we all knew from the beginning – we don’t crumble because we get old, we crumble because we eat the wrong stuff and forget to move, exercise, breathe and meditate! 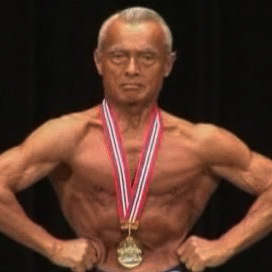 The gentleman won 1. place in the recently Japan Masters Bodybuilding Championship .